Are some teams better than others against the spread (ATS)? Let us look at the 2007 NFL point spread results and talk a bit about over-reactions in the market across years. 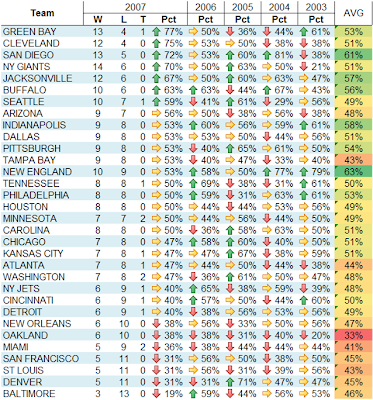 Let us look also at the percentage of wins against the spread for the past 5 years and see if there are certain teams generally under/over performing against the spread. Last year, New England was quite fascinating to watch during the market. At first, the market was not able to keep up and New England started on an 8-1 run. Then it over-reacted, placed the spread over 20 points several times and ended up the year at 53% ATS. Green Bay on the other hand, was playing solid, causing less distractions in the media, and gamblers waiting for them to crumble, but it did not happen until the semi-finals. They kept their cool and finished last year at the top with 77% ATS. According to a paper published in '03, there is no statistical evidence that the spread is biased either for specific teams or divisions. But let us take a closer look at the percentage of wins ATS in the past 5 seasons and a 5-year average. In my opinion, the right question to ask yourselves this year is, which teams will be over-and-under estimated? Meaning, which teams will get high spreads when they should not and vice-versa? Which teams are getting a lot of media attention about their playing ability (either good or bad)? There seems to be a bit of over-reaction. Meaning teams that do very well one or two years, get underestimated next year, see Tennessee, Chicago, and Seattle with the biggest exception being Oakland. So who are possible counter-reaction teams for the 2008 season? Oakland and Miami, seem to be very over-rated the past few year, but will they have enough this year to surprise the market? Should you gamble on the NFL preseason? That's up to you, but I don't recommend it. Why is the preseason different? Besides the fact that regular players do not play throughout the whole game, other factors are: player intensity is low, coaches run experimental plays, and in general, because it does not count. Statistically this means that season trends, power ratings, team stats, and regular season historical data are useless. To me this is all a bunch of crapola. Excuse my language, but I am a scientist and clearly any person that has looked at NFL historical data can tell you that there is no correlation between preseason pick success and historical preseason data. Moreover, how can you measure or build a system based on coach philosophy, intentions, and preseason strength of backup players? My NFL handicapper system waits for at least 3 weeks of regular season data to ensure a high quality model. That does not mean I will not be posting the results of my calculations throughout the first weeks, but I only start giving you and tracking my free picks after the 3rd week. Be patient, buy low, and wait for the opportunities. It's the true investor's way.